I’ve been reflecting back on our 2018, and decided that it was a bit of a ‘filler’ year – where living life came before any thrilling excitement or adventure. Most of our time has been spent parenting and renovating our home, both of which are very hard work, but incredibly fulfilling. I wouldn’t have spent 2018 any other way – though I would have requested more quality sleep. Much of spring was spent outside at our favourite hang outs. Winston, Rufus and I loved the amazing snow that fell. Otto, not so much – I have a video to prove it. During Spring we also had a lot of work done on our house including our bedroom, a family bathroom and Winston and Ru’s room. We also rearranged some of the downstairs to make everything flow better. Renovating can be really consuming at times, but I regularly remind myself that we only have ourselves to blame, and have done so much in just over a year. In May Otto was potty trained. Sounds boring, but this is an exciting milestone as a parent. I get to the point where I get fed up of nappies and can’t wait to get rid of them. His first few months were pretty ropey, but he got there and is brilliant now. Still a big fan of Lora Jensen’s technique where nappies go altogether – day and night. Our summer was low key, but very hot. Too hot for pregnant me. I sat in the garden for days watching them play in the paddling pool whilst wearing as little as possible. We went to Center Parcs with Jared’s side of the family and Scotland with my side of the family. 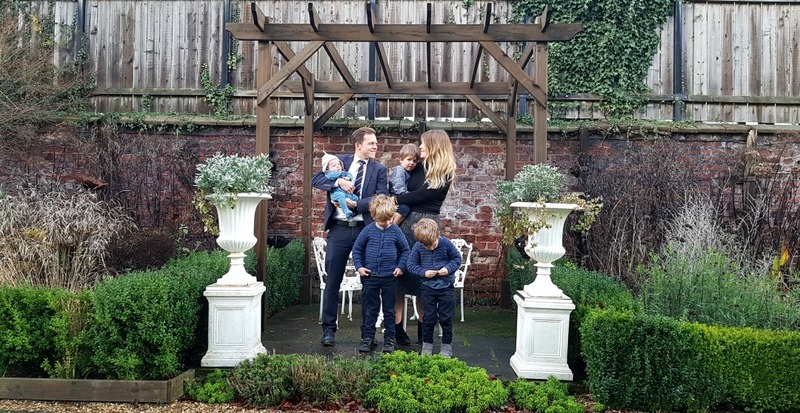 September was big for us – Otto started nursery, Rufus started school and we welcomed baby Jasper. Jared and I have both been surprised at how well Otto adapted to nursery, and how much Rufus enjoys school. Otto goes into nursery so happily, but is always tired and pleased to see me at the end of the day. We weren’t sure whether Rufus would love or hate school, but he loves it. I worried a lot about him starting – he’s my home bird and I couldn’t decide how he would respond. I feel so thankful that he settled so brilliantly. I miss his calm influence in our home, and Otto definitely misses having a proper playmate. I can’t say that Jasper has been the easiest baby. He started off very sleepy. It was a huge effort waking him up to feed to ensure that he didn’t lose too much weight. Then he had the nasty virus bronchiolitis at about 6 weeks old, which made it hard for him to keep his feeds down. He has always been a windy and sicky baby, but at three months old he’s finally putting on weight nicely, looking healthy and feeding normally. His routine is very erratic but hoping to pin him down a little more, now that he’s happier. In December we watched Win and Rufus’s first gymnastics show. It may seem small but it was a real highlight for me, and I loved every second. It was wonderful to see what they’d learnt, and working together with their classmates. Other highlights for me include a day trip to the National Space Centre, a couple of trips to Edinburgh, a few days in London, a day at Malham Cove, a weekend with my best friends, my cousin visiting from America, plus my favourite things like beach trips, mornings at the park, parents’ evenings and watching a film together every Friday. For the first time ever we slept at our house on Christmas Eve, and woke up just the six of us on Christmas morning. It was different, but I’m so glad that we took the plunge and will doing it every year. What will 2019 hold? This is a question I’ve been reflecting upon for a few weeks. I’m not a huge resolution maker but I do have a few things I want to work on through 2019. I have a family wedding to look forward to and we’ve already booked a couple of trips away, which always makes me happy. We have a few projects on the house that we want to get finished too, but above all I want to make sure that I spend lots of time with the boys and become better at really listening to them. And with that, I wish you all a very happy 2019! Previous Post Hedgehogs Don’t Live in the City! Next Post I don’t enjoy breastfeeding. Did I say that out loud? Your 2018 seemd to been a very good year!